Home Business Is your Virtual Assistant Business Struggling? 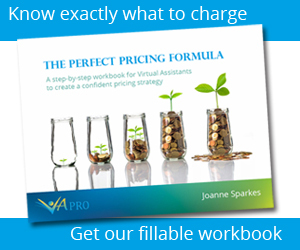 Is your Virtual Assistant Business Struggling? Are you finding it hard to get new clients? Maybe you’ve lost a few clients recently and not too sure how to replace them. Or perhaps any marketing efforts you are doing aren’t working. The result? Your business is struggling and you’re becoming more and more stressed. Whatever your reason for not having a strong client base right now, I guarantee you that you’re not alone. Regardless of whatever VA groups you’re in, or VA friends you have, you’re unlikely to ever see the real picture of how their business is, or has been, operating. So STOP thinking everyone else is doing SO much better than you. Some are. Some aren’t. Either way, does it help you get back on track with your business? Recognising and facing up to the issue is your first priority. Only you can get yourself out of it, so take a deep breath and tackle it head on. Staring at your computer screen in a desperate attempt to find a solution to your lack of clients isn’t doing you any favours. Sometimes the best thing you can do to revive a struggling business is to take a little time out. Whatever works for you to take your mind off work completely, do it. Then come back the next day (the next week or the next month) with a fresh head. Sit down, analyse and be honest. What happened in the recent days, weeks or months to result in your current situation? If you’ve lost clients, take a look at the reason(s) why that happened. Is it something you can, or should, change to reduce the risk of it happening again? If you’re pitching to potential clients but not getting any bites, how are you going about it? Review your tactic – is it clear enough; friendly yet professional; includes a focused and actionable close? If not, polish it up. And finally, take a look at what you’re doing to win new business. Are you being proactive enough? What methods are you using to drum up new clients? Could you do more? Rather than sit around getting increasingly stressed about your lack of new clients, look at this time as a plus. Use it to brush up on an existing, but perhaps slightly dusty skill, or learn a new one. If you’re more of a general VA, learning a new skill to specialise in helps you stand out from the pack. One or two hours of learning a day will help you focus, feel re-energised about your business and more confident to get back out there and market yourself. (And before you say you can’t afford it, there are plenty of free online learning tools available. So that’s not an excuse!). What if you have got the skills, you’ve niched-in and have an in-demand specialism, and you’re out there marketing yourself …. but you’re still struggling to get clients? It may be time to look at your rate card. Is it realistic or are you out-pricing yourself from the marketplace? Of course, no way am I saying you should be charging £10 an hour. But price-point should certainly be an area to review. And reviewed honestly without too much pride. (Remember to have a look at the rates of other VA’s – it may help you determine if yours are too high, or too low). Okay, we’ve covered all other angles – you’re a good VA with a strong skillset and are priced just right, so then it probably comes down to how and where you’re selling yourself. And don’t forget about reaching out to other VA’s. They may not have the capacity or expertise to take on a piece of work, so if they know you’re available they could pass it over to you instead. Finally, how’s your sales pitch? Is it powerful? Can it be used electronically and in person? Take a close look at it with a critical eye. And remember, the best pitches aren’t focused on you – as counter-productive as that may seem. Most people don’t really care about you and your business, they care about what you can do for their business. Your pitch needs to address their pain-points and how you can solve them, whilst displaying your brilliance and expertise. Naturally! Whilst these aren’t magic cures that will instantly get you out of your current slump, start working on each of them today and I guarantee you’ll be crawling your way out before too long. Or if there’s something else you’re struggling with, leave a comment below and we’ll do our best to help. Us VA’s must stick together! How effective is your shop window? Stuck in a Revenue Rut?